The What: At NAB 2019, VITEC will demonstrate its “zero-latency” MGW Ace Encoder and MGW Ace Decoder solution, which the company says achieves video contribution with no visible delay. The What Else: Powered by the VITEC HEVC GEN2+ codec, the solution delivers 16-millisecond glass-to-glass latency. This codec provides HEVC video quality up to 4:2:2 10-bit. 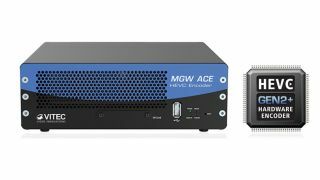 The MGW Ace Encoder and MGW Ace Decoder pair provide flexible connectivity options, including HD-SDI and HDMI, and are backward compatible with H.264. The Bottom Line: The MGW Ace solution is designed to deliver bandwidth-efficient HEVC in a compact, low-power-consumption form factor for contribution workflows that require the highest video quality and lowest latency.